This Benjamin Franklin letter is part of a series of letters he wrote about his studies of electricity that made him a household name. Franklin sent these letters to his friend Peter Collinson, who was a member of the Royal Society in London, an organization that promoted the study of the sciences. Collinson put Franklin's letters together in a book called "Experiments and Observations on Electricity Made at Philadelphia in America". This book became the most reprinted book of the 18th century and made Franklin's name famous. In this particular letter, Franklin discusses how electricity, what he refers to as "electrical fluid," passes from one object to another. He talks about how he discovered that pointed objects conduct electricity better than blunt objects, which led him to postulate about the possibility of constructing a lightning rod to protect buildings from lightning strikes. This is the first time such an invention was thought of. Franklin gives several experiments one can perform to verify his observations and includes the plans for creating a lightning rod to test whether or not lightning is indeed electrical in nature. His plans for a lightning rod were later performed in France, before he even performed them himself. 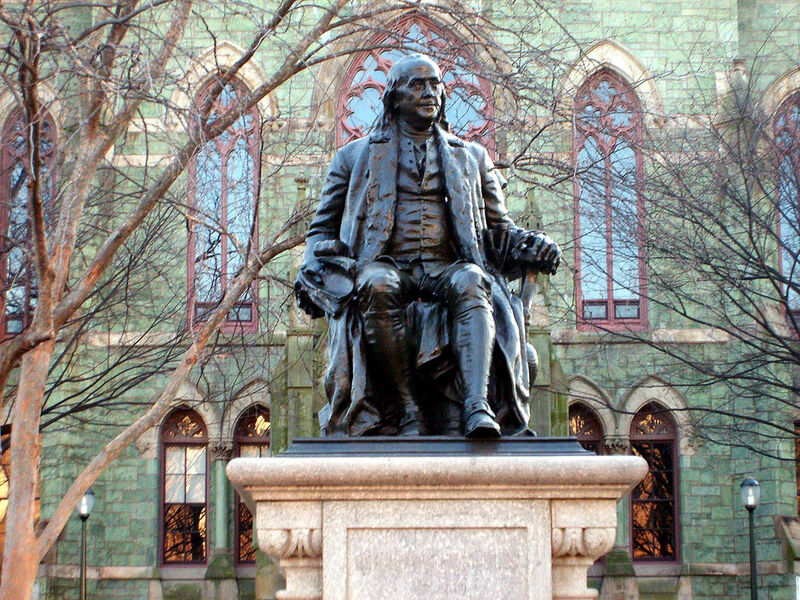 You can read more about Franklin's history of studying electricity at our Benjamin Franklin and Electricity page. You can also read his other letters at our Benjamin Franklin and Electricity letters page. Opinions and Conjectures concerning the Properties and Effects of the Electrical Matter, arising from Experiments and Observations made in Philadelphia, 1749. 1. The Electrical Matter consists of Particles extreamly subtile, since it can permeate common Matter, even the densest Mettals, with such Ease and Freedom, as not to receive any perceptible Resistance. 2. If any one should doubt, whether the Electrical Matter passes thro' the Substance of Bodies, or only over and along their Surfaces, a Shock from an electrified large Glass Jar, taken thro' his own Body, will probably convince him. 3. Electrical Matter differs from common Matter in this, That the Parts of the latter mutually attract, those of the former mutually repel each other: Hence the appearing Divergency in a Stream of Electrical Effluvia. 4. But tho' the Particles of Electrical Matter do repel each other, they are strongly attracted by all other Matter. 5. From these three Things, the extream Subtilty of the Electrical Matter, the mutual Repulsion of it's Parts, and the strong Attraction between them and other Matter, arises this Effect; That when a Quantity of Electrical Matter is apply'd to a Mass of common Matter, of any Bigness or Length within our Observation, which has not already got it's Quantity; it is immediately and equally diffused thro' the whole. 6. Thus common Matter is a Kind of a Spunge to the Electrical Fluid. And as a Spunge would receive no Water, if the Parts of Water were not smaller than the Pores of the Spunge; and even then but slowly, if there were not a mutual Attraction between those Parts, and the Parts of the Spunge; and would still imbibe it faster, if the mutual Attraction among the Parts of the Water did not impede, some Force being required to separate them: and fastest, if instead of Attraction there were a mutual Repulsion among those Parts, which would act in Conjunction with the Attraction of the Spunge: So is the Case between the Electrical and common Matter. 7. But in common Matter there is (generally) as much of this Electrical as it will contain within it's Substance. If more is added, it lies without, upon the Surface, and forms what we call an Electrical Atmosphere: and then the Body is said to be electrified. 8. Tis supposed, That all Kinds of common Matter do not attract and retain the Electrical with equal Strength and Force, for Reasons to be given hereafter; and that those called Electrics per se, as Glass &c. attract and retain it strongest, and contain the greatest Quantity. 9. We know that the Electrical Fluid is in common Matter, because we can pump it out, by the Globe or Tube. We know that common Matter has near as much as it can contain; because when we add a little more to any Portion of it, the additional Quantity does not enter, but forms an electrical Atmosphere: And we know that common Matter has not (generally) more than it can contain; otherwise all loose Portions of it would repel each other, as they constantly do, when they have electrical Atmospheres. 10. The beneficial Uses of this Electrical Fluid we are not yet well acquainted with; tho' doubtless such there are and great ones; but we may see some pernicious Consequences that would attend a much greater Proportion of it. For had this Globe we live on, as much of it in Proportion, as we can give to a Globe of Iron, Wood, or the like, the Particles of dust and other light Matters, that get loose from it, would, by Vertue of their separate electrical Atmospheres, not only repel each other, but be repelled from the Earth, and not easily be brought to unite with it again. Whence our Air would continually be more and more clogg'd with foreign Matters, and grow unfit for Respiration. This affords another Occasion of adoring that Wisdom which has made all Things by Weight and Measure! 11. If a Piece of common Matter be supposed intirely free from Electrical Matter, and a single Particle of the latter be brought nigh, 'twill be attracted and enter the Body, and take Place in the Center, or where the Attraction is every way equal. If more Particles enter, they take their Places where the Ballance is equal between the Attraction of the common Matter and their own mutual Repulsion. 'Tis suppos'd they form Triangles, whose Sides shorten as the Number increases; till the common Matter has drawn in so many, that it's whole Power of compressing those Triangles by Attraction is equal to their whole Power of expanding themselves by Repulsion. Then will such Piece of Matter receive no more. 12. When Part of this natural Proportion of Electrical Fluid is taken out of a Piece of common Matter, the Triangles form'd by the Remainder are supposed to widen by the Mutual Repulsion of the Parts, until they occupy the whole Piece. 13. When the Quantity of Electrical Fluid, taken from a Piece of common Matter, is restored to it again, it enters; the expanded Triangles being again comprest, till there is Room for the whole. 14. To explain this, Take two Apples or two Balls of Wood or other Matter A, B, each having its own natural Quantity of the Electrical Fluid. Suspend them by Silk Strings from the Ceiling. Apply the Wire of a well charged Vial to A, which will receive from the Wire a Quantity of the electrical Fluid, but will not imbibe it, being already full. The Fluid will therefore flow round it's Surface and form an electrical Atmosphere. Bring A into Contact with B, and half the electrical Fluid is communicated; so that each has now an electrical Atmosphere (made of half the Quantity) and therefore they repel each other. Take away these Atmospheres by touching the Balls, and leave them in their natural State. Then having fixt a Stick of Sealing Wax to the Middle of the Phial, to hold it by, apply the Wire to A at the same time the Coating touches B. Thus will a Quantity of the Electrical Fluid be drawn out of B, and thrown on A, so that A will have a Redundance of this Fluid which forms an Atmosphere round it, and B an exactly equal Deficiency. Now bring these Balls again into Contact, and the Electrical Atmosphere will not be divided between A and B into two smaller Atmospheres, as before: for B will drink up the whole Atmosphere of A, and both will be found again in their natural State. 15. The Form of the Electrical Atmosphere is that of the Body it surrounds. This Shape may be rendered visible in still Air, by raising a Smoke from dry Rosin, dropt into a hot Tea-Spoon under the electrified Body, which will be attracted and spread itself equally on all Sides, covering and concealing the Body. And this Form it takes, because it is attracted by all Parts of the Surface of the Body, tho' it can not enter the Substance already replete. Without this Attraction it would not remain round the Body, but dissipate in the Air. 16. The Atmosphere of Electrical Particles surrounding an electrify'd Sphere, is not more disposed to leave it, or more easily drawn off from any one Part of the Sphere than from another, because it is equally attracted from every Part. But that is not the Case with Bodies of any other Figure. From a Cube it is more easily drawn out at the Corners than at the plane Sides; and so from the Angles of a Body of any other Form, and still most easily from that Angle, that is most acute. Thus if a Body shaped as A, B, C, D, E be electrify'd or have an Electrical Atmosphere communicated to it, and we consider every Side as a Base on which the Particles rest, and by which they are attracted, one may see by imagining a Line from A to F and another from E to G, That the Portion of the Atmosphere included in F A E G has the Line A E for it's Basis. So the Portion of Atmosphere included between the Lines H A, A B, and B I has the Line A B for it's Basis. And likewise the Portion included in K, B, C, L, has B C to rest on; and so on the other Side of the Figure. Now if you would draw off this Atmosphere with a blunt smoothe Body and approach the Middle of the Side A, B, you must come very near before the Force of your Attracter exceeds the Power with which that Side holds it's Atmosphere. But there is a small Portion between I B K that has less of the Surface to rest on and to be attracted by, than the neighbouring Portions; while at the same Time there is a mutual Repulsion between it's Particles, and the Particles of those Portions: Therefore here you can get it with more Ease, or at a greater Distance. Between F, A H, there is a larger Portion, that has yet a less Surface to rest on and to attract it: here therefore you can get it away still more easily: But easiest of all between L, C, M, where the Quantity is the largest, and the Surface to attract and keep it back the least. When you have drawn away one of these angular Portions of the Fluid, another succeeds in it's Place, from the Nature of Fluidity and the mutual Repulsion before mentioned; and so the Atmosphere continues flowing off at such Angle like a Stream, 'till no more is remaining. The Extremities of the Portions of Atmosphere over these angular Parts, are likewise at a greater Distance from the Electrified Body, as may be seen by Inspection of the above Figure, than any Part of the other Portions: The Point of the Atmosphere of the Angle C, being much further from C, than any Part of the Atmosphere over the Lines C B or B A. And, besides the Distance arising from the Nature of the Figure, where the Attraction is less the Particles will naturally expand to a greater Distance by their mutual Repulsion. On these Accounts, we suppose Electrified Bodies discharge their Atmospheres upon unelectrified Bodies more easily, and at a greater Distance, from their Angles and Points, than from their smoothe Sides. Those Points will also discharge into the Air, when the Body has too great an electrical Atmosphere, without bringing any Non-electric near to receive what is thrown off. For the Air, tho' itself an Electric per se, yet has always, more or less, Water and other non-electric Matters mixt with it; and these attract and receive what is so discharged. 17. But Points have a Property by which they draw on as well as throw off the Electrical Fluid, at greater Distances than blunt Bodies can. That is, as the pointed Part of an electrify'd Body will discharge the Atmosphere of that Body, or communicate it farthest to another Body: so the Point of an unelectrifyed Body will draw off the Electrical Atmosphere from an electrified Body, farther than a blunter Part of the same unelectrified Body will do. Thus a Pin held by the Head, and the Point presented to an electrified Body, will draw off it's Atmosphere at a Foot Distance; where, if the Head were presented instead of the Point, no such Effect would follow. To understand this, we may consider, that if a Person, standing on the Floor, would draw off the Electrical Atmosphere from an electrified Body; an Iron Crow, and a blunt Knitting-Needle held alternately in his Hand, and presented for that Purpose, do not draw with different Forces, in Proportion to their different Masses. For the Man, and what he holds in his Hand, be it large or small, are connected with the common Mass of unelectrify'd Matter; and the Force with which he draws is the same in both Cases; It consisting in the different Proportion of Electricity in the electrified Body and that common Mass. But the Force with which the electrified Body retains it's Atmosphere, by attracting it, is proportioned to the Surface over which the Particles are plac'd; i.e. four square Inches of that Surface retain their Atmosphere with 4 times the Force, that one square Inch retains it's Atmosphere. And as in Plucking the Hairs from the Horse's Tail, a Degree of Strength, insufficient to pull away a Handful at once, could yet easily strip it Hair by Hair; so a blunt Body presented, cannot draw off a Number of Particles at once; but a pointed one, with no greater Force, takes them away easily, Particle by Particle. 18. These Explanations of the Power and Operation of Points, when they first occurred to me, and while they floated in my Mind, appear'd perfectly satisfactory: But now I have wrote them, and considered them more closely in black and white, I must own, I have some Doubts about them. Yet as I have at present Nothing better to offer in their Stead, I do not cross them out: for even a bad Solution read, and it's Faults discovered, has often given Rise to a good one in the Mind of an ingenious Reader. 19. Nor is it of much Importance to us to know the Manner in which Nature executes her Laws 'tis enough, if we know the Laws themselves. 'Tis of real Use to know, that China left in the Air unsupported, will fall and break; but how it comes to fall, and why it breaks, are Matters of Speculation. 'Tis a Pleasure indeed to know them, but we can preserve our China without it. 20. Thus in the present Case, to know this Power of Points may possibly be of some Use to Mankind, tho' we should never be able to explain it. The Following Experiments, as well as those in my first Paper shew this Power. I have a large Prime Conductor, made of several thin Sheets of Fullers Pastboard form'd into a Tube, near 10 Foot long, and a Foot diameter. It is covered with Dutch embossed Paper almost totally gilt. This large metalline Surface supports a much greater electrical Atmosphere than a Rod of Iron of 50 Times the Weight would do. It is suspended by Silk Lines, and when charged will strike at near two Inches Distance, a pretty hard Stroke, so as to make one's Knuckle ache. Let a Person standing on the Floor, present the Point of a Needle, at 12 or more Inches Distance from it; and while the Needle is so presented, the Conductor cannot be charg'd; the Point drawing off the Fire as fast as it is thrown on by the Electrifying Globe. Let it be charg'd and then present the Point at the same Distance, and it will suddenly be discharg'd. In the Dark, you see a Light on the Point, when the Experiment is made. And if the Person, holding the Point, stands upon Wax, he will be electrified by receiving the Fire at that Distance. Attempt to draw off the Electricity with a blunt Body, as a Bolt of Iron round at the End and smoothe (A Silversmith's Iron Punch an Inch thick is what I use) and you must bring it within a Distance of near 2 Inches before You can do it; and then, it is done with a Stroke and Crack. As the Pasteboard Tube hangs loose on Silk Lines; when you approach it with the Punch Iron, it likewise will move towards the Punch; being attracted, while it is charg'd. But if at the same Instant a Point be presented, as before, it retires again, for the Point discharges it. Take a Pair of large Brass scales, of two (or more) Feet Beam; the Cords of the Scales being Silk. Suspend the Beam by a Packthread from the Cieling, so that the Bottom of the Scales may be about a Foot from the Floor. The Scales will move round in a Circle by the untwisting of the Packthread. Set the Iron Punch on End upon the Floor, in such a Place, as that the Scales may pass over it, in making their Circle; then Electrify one Scale by applying the Wire of a charged Vial to it. As they move round, you see the Scale draw nigher to the Floor, and dip more when it comes over the Punch; and if that be placed at a proper Distance, the Scale will snap and discharge it's Fire into it. But if a Needle be stuck on the End of the Punch, it's Point upwards, the Scale instead of drawing nigh to the Punch and snapping, discharges it's Fire silently, thro' the Point, and rises higher from the Punch. Nay even if the Needle be plac'd upon the Floor, near the Punch, it's Point upwards, the End of the Punch tho' so much higher than the Needle, will not attract the Scale and receive it's Fire, for the Needle will get it and convey it away, before it comes nigh enough for the Punch to act. And this is constantly observable in these Experiments, that the greater Quantity of Electricity in the Pastboard Tube, the farther it strikes or discharges its Fire. And the Point likewise will draw it off at a still greater Distance. Now if the Fire of Electricity, and that of Lightning, be the same; as I have endeavoured to shew at large in a former Paper; this Pastboard Tube and these Scales may represent electrified Clouds. If a Tube only 10 Foot long, will strike and discharge it's Fire on the Punch at 2 or 3 Inches Distance; an electrified Cloud of perhaps 10,000 Acres may strike and discharge on the Earth at a proportionably greater Distance. The horizontal Motion of the Scales over the Floor may represent the Motion of the Clouds over the Earth, and the Erect Iron Punch a Hill or high Building: and then we see how electrified Clouds passing over Hills or high Buildings, at too great a Height to strike, may be attracted lower till within their striking Distance. And lastly if a Needle fixt on the Punch, with it's Point upright, or even on the Floor, below the Punch, will draw the Fire from the Scale silently at a much greater than the striking Distance and so prevent it's descending towards the Punch; Or if in it's Course, it would have come nigh enough to strike, yet, being first deprived of it's Fire it cannot; and the Punch is thereby secured from the Stroke. I say, if these Things are so, may not the Knowledge of this Power of Points be of Use to Mankind; in preserving Houses, Churches, Ships &c. from the Stroke of Lightning; by Directing us to fix on the highest Parts of those Edifices upright Rods of Iron, made sharp as a Needle and gilt to prevent Rusting, and from the Foot of those Rods a Wire down the outside of the Building into the Ground; or down round one of the Shrouds of a Ship and down her Side, till it reach'd the Water? Would not these pointed Rods probably draw the Electrical Fire silently out of a Cloud before it came nigh enough to strike, and thereby secure us from that most sudden and terrible Mischief! 21. To determine the Question, Whether the Clouds that contain Lightning are electrified or not, I would propose an Experiment to be try'd where it may be done conveniently. On the Top of some high Tower or Steeple, place a Kind of Sentry Box big enough to contain a Man and an electrical Stand. From the Middle of the Stand let an Iron Rod rise, and pass bending out of the Door, and then upright 20 or 30 feet, pointed very sharp at the End. If the Electrical Stand be kept clean and dry, a Man standing on it when such Clouds are passing low, might be electrified, and afford Sparks, the Rod drawing Fire to him from the Cloud. If any Danger to the Man should be apprehended (tho' I think there would be none) let him stand on the Floor of his Box, and now and then bring near to the Rod, the Loop of a Wire, that has one End fastened to the Leads; he holding it by a Wax-Handle. So the Sparks, if the Rod is electrified, will Strike from the Rod to the Wire and not affect him. 22. Before I leave this Subject of Lightning, I may mention some other Similarities between the Effects of that and those of Electricity. Lightning has often been known to strike People blind. A Pigeon that we struck dead to Appearance by the Electrical Shock, recovering Life, droopt about the Yard several Days, ate Nothing, tho' Crums were thrown to it, but declined and dyed. We did not then think of it's being deprived of Sight; but afterwards a Pullet struck dead in like Manner, being recover'd by repeated blowing into it's Lungs, when set down on the Floor, ran headlong against the Wall, and on Examination appear'd perfectly blind. Hence we concluded, that the Pigeon had been absolutely blinded by the Shock. The biggest Animal we have yet killed, or try'd to kill with the Electrical Stroke was a well grown Pullet. 23. Reading the ingenious Dr. Hales's Account of the Thunder Storm at Stretham, the Effect of the Lightning in stripping off all the Paint that had covered a gilt Moulding of a Pannel of Wainscot, without hurting the Rest of the Paint: I had a Mind to lay a Coat of Paint over the filleting of Gold on the Cover of a Book, and try the Effect of a strong electrical Flash sent thro' that Gold from a charged Sheet of Glass. But having no Paint at Hand, I pasted a narrow strip of Paper over it; and when dry sent a Flash thro' the Gilding; by which the Paper was torne off from End to End with such Force, that it was broke in several Pieces, and in others brought away Part of the Grain of the Turky Leather, in which the Book was bound; and convinced me that had it been painted, the dry Paint would have been stripped off in the same Manner with that on the Wainscot at Stretham. We have also melted Gold, Silver and Copper in small Quantities by the Electrical Flash. The Manner is this: Take Leaf Gold, Leaf Silver or Leaf gilt Copper, commonly call'd Leaf Brass or Dutch Gold. Cut off from the Leaf long narrow Strips the Breadth of a Straw; Place one of these Strips between two Strips of smoothe Glass that are about as wide as your Finger. If one Strip of Gold, the Length of the Leaf, be not long enough for the Glass, add another to the End of it; so that you may have a little Part hanging out loose at each End of the Glass. Bind the Pieces of Glass together from End to End with a Silk Cord. Then place it so as to be part of an Electrical Circle (the Ends of Gold hanging out, being of Use to joyn with the other Parts of the Circle) and send the Flash thro it from a large electrified Jar. Then if your Strips of Glass remain whole you will see that the Gold is missing in several Places, and instead of it, a metalline Stain on both the Glasses. The Stains on the upper and under Glass are exactly similar in the Minutest Stroak, as may be seen by holding them to the Light. The Metal appears to have been not only melted, but even to be vitrified, or otherwise so driven into the Pores of the Glass as to be protected by it from the Action of the Strongest Aqua fortis or Aqua Regia. I send you inclosed two little Pieces of Glass with these metaline stains upon them, which can not be removed without taking Part of the Glass with them. Sometimes the Stain spreads a little wider than the Breadth of the Leaf; and looks brighter at the Edge, as by inspecting closely you may observe in these. Sometimes the Glass breaks to Pieces. Once the upper Glass broke into a thousand Pieces like coarse Salt. These Pieces I send you were stained with Dutch Gold; true Gold makes a darker Stain somewhat reddish, Silver a greenish Stain. We once took two Pieces of thick Looking Glass, as broad as a Gunters Scale, and six Inches long; and placing Leaf Gold between them, put them betwixt two smoothly plain'd Pieces of Wood, and fixt them tight in a Bookbinder's small Press: yet tho' they were so closely confined; the Force of the Electrical Shock shiver'd the Glass into many Pieces. The Gold was melted and stain'd into the Glass as usual. The Circumstances of breaking the Glass differ much in Repeating the Experiment, and sometimes it does not break at all: But this is constant, that the Stains, in the upper and under Pieces, are exact Counterparts of each other: And tho' I have often taken up the Pieces of Glass immediately after this melting, between my Fingers, I never could perceive the least Warmth in them. 25. In one of my former Papers I mentioned that Gilding on a Book, tho' at first it communicated the Shock perfectly well, yet fail'd after a few Experiments, which we could not account for. We have since found, that one strong Shock breaks the Continuity of the Gold in the Filetting, and makes it look rather like Dust of Gold; Abundance of it's Parts being broken and driven off; And it will seldom conduct above one strong Shock. Perhaps this may be the Reason; When there is not a perfect Continuity in the Circle, the Fire must leap over the Vacancies; there is a certain Distance which it is able to leap over a Vacancy, according to it's Strength; if a Number of small Vacancies, tho' each be very minute, taken together exceed that Distance, it can not leap over them, and so the Shock is prevented. 26. From the before mentioned Law of Electricity, That Points as they are more or less acute, both draw on and throw off the Electrical Fluid with more or less Power, and at greater or less Distances, and in larger or smaller Quantities in the same Time; we may see how to account for the Situation of the Leaf-Gold suspended between two Plates, the upper one continually electrified, the under one in a Person's Hand standing on the Floor. When the upper Plate is Electrified, the Leaf is attracted and raised towards it, and would fly to that Plate, were it not for it's own Points: the Corner that happens to be uppermost, as the Leaf is rising; being a sharp Point from the extream Thinness of the Gold, draws and receives at a Distance a sufficient Quantity of the electrical Fluid, to give itself an Electrical Atmosphere, by which it's Progress to the upper Plate is stopt, and it begins to be repell'd from that Plate, and would be driven back to the under Plate, but that it's lowest Corner is likewise a Point, and throws off or discharges the Overplus of the Leaf's Atmosphere, as fast as the upper Corner draws it on. Were these two Points perfectly equal in Acuteness, the Leaf would take Place exactly in the middle Space; for it's Weight is a Trifle compar'd to the Power acting on it. But it is generally nearest the unelectrified Plate, because, when the Leaf is offered to the electrified Plate at a Distance, the sharpest Point is commonly first affected, and raised towards it; so that Point from it's greater Acuteness receiving the Fluid faster than it's opposite can discharge it at equal Distances, it retires from the electrified Plate, and draws nearer to the unelectrified Plate, 'till it comes to a Distance where the Discharge can be exactly equal to the Receipt, the latter being lessened and the former increased; and there it remains, as long as the Globe continues to supply fresh Electrical Matter. This will appear plain, when the Difference of Acuteness in the Corners is made very great. Cut a Piece of Dutch Gold (which is the fittest for these Experiments, on Account of it's greater Strength) into the Form in the Margin; the upper Corner a right Angle, the two next obtuse Angles, and the lowest a very acute one; and bring this on your Plate under the electrified Plate, in such a Manner, as that the right Angle Part may be first raised (which is done by covering the Narrow End with the Hollow of your Hand) and you will see this Leaf take Place much nearer to the upper than to the under Plate; because without being nearer, it can not receive so fast at its right angle'd Point as it can discharge at it's acute one. Turn this Leaf with the acute Part uppermost, and then it takes Place nearest the unelectrified Plate; because otherwise it receives faster at its acute Point than it can discharge at it's right angled one. Thus the Difference of Distance is always proportioned to the Difference of Acuteness. Take Care, in cutting your Leaf to leave no little ragged Particles on the Edges, which sometimes form Points where you would not have them. You may make this Figure so acute below and dull above, as to need no under Plate: it discharging fast enough into the Air. When it is made narrower; as the Figure between the prickt Lines, we call it the Golden Fish, from its Manner of Acting: for if you take it by the Tail, and hold it at a Foot or greater horizontal Distance from the Prime Conductor, it will, when let go, fly to it with a brisk but waving Motion, like that of a Fish thro' the Water: It will then take Place under the Prime Conductor, at perhaps a Quarter or Half an Inch Distance, and keep continual Shaking of it's Tail like a Fish; so that it seems animated. Turn it's Tail to the Prime Conductor, and then it flies to your Finger and seems to nibble it. And if you hold a Plate under it at 6 or 8 Inches Distance, and cease turning the Globe; when the Electrical Atmosphere of the Conductor grows small, it will descend to the Plate and swim back again several Times with the same Fish-like Motion, greatly to the Entertainment of Spectators. By a little Practice in dulling or sharpning the Heads or Tails of these Figures, you make them take Places as desired, nearer or farther from the Electrified Plate. 27. It is said in Section 8. of this Paper that all Kinds of common Matter are supposed not to attract the Electrical Fluid with equal Strength: and that those call'd Electrics per Se, as Glass &c. attract and retain it strongest, and contain the greatest Quantity. This latter Position may seem a Paradox to some, being contrary to the hitherto received Opinion, and therefore I shall now endeavour to explain it. 28. In Order to this, let it first be consider'd That we can not, by any Means we are yet acquainted with, force the Electrical Fluid thro' Glass. I know it is commonly thought that it easily pervades Glass; and the Experiment of a Feather suspended by a Thread in a Bottle hermetically sealed, yet moved by bringing a rubb'd Tube near the outside of the Bottle, is alledg'd to prove it. But if the Electrical Fluid so easily pervades Glass, How does the Vial become charg'd (as we term it) when we hold it in our Hands? Would not the Fire thrown in by the Wire, pass thro' to our Hands, and so escape into the Floor? Would not the Bottle in that Case be left just as we found it, uncharg'd; as we know a Metal Bottle, so attempted to be charg'd would be? Indeed if there be the least Crack, the minutest Solution of Continuity in the Glass, tho' it remains so light, that Nothing else we know of will pass, yet the extreamly subtile electrical Fluid, flies thro' such a Crack with the greatest Freedom, and such Bottle we know can never be charg'd: What then makes the Difference between such a Bottle, and one that is sound, but this; That the Fluid can pass thro' the one and not thro' the other? 29. It is true, there is an Experiment that at first Sight would be apt to satisfy a slight Observer, that the Fire thrown into the Bottle by the Wire does really pass thro' the Glass. It is this: Place the Bottle on a Glass Stand under the Prime Conductor: suspend a Bullet by a Chain from the Prime Conductor, 'till it comes within a quarter of an Inch, right over the Wire of the Bottle; Place your Knuckle on the Glass Stand, at just the same Distance from the Coating of the Bottle, as the Bullet is from it's Wire. Now let the Globe be turnd, and you see a Spark strike from the Bullet to the Wire of the Bottle, and the same Instant you see and feel an exactly equal Spark striking from the Coating to your Knuckle: an so on Spark for Spark. This looks, as if the whole received by the Bottle was again discharged from it: and yet the Bottle by this means is chargd! And therefore the Fire that thus leaves the Bottle, tho' the same in Quantity, can not be the very same Fire that entered at the Wire: For, if it were, the Bottle would remain uncharg'd. 30. If the Fire that so leaves the Bottle be not the same that is thrown in, thro' the Wire, it must be Fire that subsisted in the Bottle (that is in the Glass of the Bottle) before the Operation begun. 31. If so, there must be a great Quantity in Glass, because a great Quantity is thus discharg'd even from very thin Glass. 32. That this Electrical Fluid or Fire, is strongly attracted by Glass, we know from the Quickness and Violence with which it is resum'd by the Part that had been deprived of it, when there is an Opportunity. And by this, that we can not from a Mass of Glass draw a Quantity of Electrical Fire; or electrify the whole Mass minus, as we can a Mass of Metal. We cannot lessen nor increase it's whole Quantity; for what it has it holds; and it has as much as it can hold: It's Pores are fill'd with it as full as the mutual Repellency of the Particles will admit: and what is already in, refuses or strongly repels any additional Quantity. Nor have we any Way of Moving this Electrical Fluid in Glass, but one; that is, by covering Part of the two Surfaces of thin Glass with Non-electrics; and then throwing an additional Quantity of this Fluid on one Surface, which spreading in the Non-electric; and being bound to that Surface by it, acts by it's repelling Force on the Particles of electrical Fluid contain'd in the other Surface, and drives them out of the Glass into the Non-electric on that Side from whence they are discharg'd; And those added on the charg'd Side can then enter. But when this is done, there is no more in the Glass, nor less than before; just as much having left it on one Side, as it received on the other. 33. I feel a Want of Terms here, and doubt much, whether I shall be able to make this intelligible. By the Word Surface in this Case, I do not mean mere Length and Breadth without Thickness: But when I speak of the upper or under Surface of a Piece of Glass, the outer or inner Surface of the Phial, I mean Length, Breadth and half the Thickness; and beg the Favour of being so understood. Now I suppose that Glass in it's first Principles, and in the Furnace, has no more of this electrical Fluid than other common Matter: That when it is blown, as it cools, and the Particles of common Fire leave it, it's Pores become a perfect Vacuum: That the component Parts of Glass are extreamly small and fine, I guess from it's never shewing a rough Face where it breaks, but always a Polish; and from the Smallness of its Particles, I suppose the Pores between them must be exceeding small; which is the Reason that Aqua fortis, nor any other Menstruum we have, can enter to separate them, and dissolve the Substance, nor is any Fluid we know of, fine enough to enter, except common Fire and the electrical Fluid. Now the Departing Fire, leaving a Vacuum, as aforesaid, between these Pores, which Air nor Water are fine enough to enter and fill; the Electrical Fluid (which is every where ready in what we call the Non-electrics, and in the Non-electric Mixtures that are in the Air) presses or is attracted in: yet does not become fixt with the Substance of the Glass, but subsists there as Water in a Porous Stone, retain'd only by the Attraction of the fixt Parts, itself still loose and fluid. But I suppose farther, that in the Cooling of the Glass, it's Texture becomes closest in the Middle, and forms a Kind of Partition, in which the Pores are so narrow, that the Particles of the Electrical Fluid, which enter both Surfaces at the same Time, cannot go thro' or pass and repass from one Surface to the other, and so mix together. Yet tho' the Particles of Electrical Fluid imbib'd by each Surface can not themselves pass thro' to those of the other, their Repellency can; and by this Means they act on one another. The Particles of Electrical Fluid have a mutual Repellency, but by the Power of Attraction in the Glass, they are condensed or forced nearer to each other. When the Glass has receiv'd, and by it's Attraction forced closer together so much of this elastic Fluid, as that the Power of Attracting and condensing in the one is equal to the Power of Expansion in the other, it can imbibe no more, and that remains it's constant whole Quantity; But each Surface could receive more, if the Repellency of what is in the opposite Surface did not resist it's Entrance. The Quantities of this Fluid in each Surface being equal, their repelling Action on each other is equal: and therefore those of one Surface cannot drive out those of the other. But if a greater Quantity is forced into one Surface than the Glass would naturally draw in; this increases the repelling Power on that Side, and overpowering the Attraction on the Other, drives out Part of the Fluid, that had been imbibed by that Surface, if there be any Non-electric ready to receive it: Such there is in all Cases, where Glass is electrified to give a Shock. The Surface that has been thus emptied, by having it's Electrical Fluid driven out, resumes again an equal Quantity with Violence, as soon as the Glass has an Opportunity to discharge that over Quantity, more than it could retain by Attraction in it’s other Surface, by the additional Repellency of Which the Vacuum had been occasioned. For Experiments favouring this Hypothesis, I must, to avoid Repetition, beg Leave to refer you back to what is said of the Electrical Vial in my former Papers. 34. Let us now see, how it will account for several other Appearances. Glass, a Body extreamly elastic (and perhaps it's Elasticity may be owing in some Degree to the subsisting of so great Quantity of this repelling Fluid in it's Pores) must, when rubb'd, have it's rubb'd Surface somewhat stretcht, or it's solid Parts drawn a little farther asunder; so that the Vacancies in which the Electrical Fluid resides, become larger, affording Room for more of that Fluid, which is immediately attracted into it, from the Cushion or Hand rubbing, they being supply'd from the common Stock. But the Instant the Parts of the Glass so opened and filled have past the Friction, they close again, and force the additional Quantity out upon the Surface, where it must rest, till that Part comes round to the Cushion again; unless some Non-electric (as the Prime Conductor) first presents to receive it. In the Dark, the Electrical Fluid may be seen on the Cushion in two Semi-circles or Half-moons, one on the Fore-Part, the other on the Back Part of the Cushion, just where the Globe and Cushion separate. In the fore Crescent, the Fire is passing out of the Cushion into the Glass; in the other it is leaving the Glass and returning into the Back Part of the Cushion. When the Prime Conductor is apply'd, to take it off the Glass, the back Crescent disappears. But if the inside of the Globe be lined with a Non-electric, the additional Repellency of the electrical Fluid thus collected by Friction in the rubb'd Part of the Globe's outer Surface, drives an equal Quantity out of the inner Surface into that Non-electric Lining, which receiving it and carrying it away from the rubb'd Part into the common Mass thro' the Axis of the Globe and Frame of the Machine; The new collected Electrical Fluid can enter and remain in the outer Surface, and none of it, or a very little, will be received by the Prime Conductor. As this charg'd Part of the Globe comes round to the Cushion again, the outer Surface delivers it's Overplus Fire into the Cushion; the opposite inner Surface receiving at the same Time an equal Quantity from the Floor. Every Electrician knows that a Globe wet within will give little or no Fire; the Reason has not before been attempted to be given that I know of. 35. So if a Tube lined with a Non-electric be rubb'd, little or no Fire is obtained from it. What is collected from the Hand in the downward rubbing Stroke entring the Pores of the Glass, and driving an equal Quantity out of the inner Surface into the Non-electric Lining. And the Hand in passing up to take a second Stroke, takes out again what had been thrown into the outer Surface; and then the inner Surface receives back again, what it had given to the Non-electric Lining. Thus the Particles of Electrical Fluid belonging to the inside Surface go in and out of their Pores every Stroke given to the Tube. Put a Wire into the Tube, the inward End in Contact with the Non-electric Lining, so it will represent the Leyden Bottle. Let a Second Person touch the Wire while you rub, and the Fire driven out of the inward Surface, when you give the Stroke, will pass thro' him into the common Mass, and return thro' him, when the inner Surface resumes it's Quantity; and therefore this new Kind of Leiden Bottle can not so be charg'd; But thus it may. After every Stroke, before you pass your Hand up to make another, let the second Person apply his Finger to the Wire, take the Spark and then withdraw his Finger; and so on till he has drawn a Number of Sparks; thus will the inner Surface be exhausted, and the outer Surface charg'd. Then wrap a Sheet of gilt Paper close round the outer Surface; and grasping it with one Hand, you may receive a Shock, by applying the Finger of the other Hand to the Wire. For now the vacant Pores in the inner Surface resume their Quantity, and the overcharg'd Pores in the outer Surface discharge that Overplus: the Equilibrium being restored thro' your Body, which could not be restored thro' the Middle of the Glass. If the Tube be exhausted of Air a Non-electric Lining in Contact with the Wire is not necessary: For in Vacuo, the Electrical Fire will fly freely from the inner Surface to the Wire, and back again from the Wire to the inner Surface, without a Non-electric Conductor. But Air resists it's Motion, for being itself an Electric per Se, it does not attract it, having already it's Quantity. So the Air never draws off an Electrical Atmosphere from any Body, but in Proportion to the Non electrics mixt with it: It rather keeps such an Atmosphere confined, which from the mutual Repulsion of it's Particles tends to dissipation, and would immediately dissipate in Vacuo. And thus the Experiment of the Feather inclosed in a Glass Vessel hermetically seal'd but moving on the Approach of the rubbed Tube is explained. When an additional Quantity of the Electrical Fluid is apply'd to the Side of the Vessel by the Atmosphere of the Tube, a Quantity is repell'd and driven out of the inner Surface of that Side into the Vessel, and there affects the Feather; returning again into it's Pores, when the Tube with it's Atmosphere is withdrawn: not that the Particles of that Atmosphere did themselves pass thro' the Glass to the Feather. And every other Appearance I have yet seen, in which Glass and Electricity are concern'd, are I think explain'd, with equal Ease, by the same Hypothesis. Yet perhaps it may not be a true one, and I shall be obliged to him that affords me a better. 2. That the Electrical Fire freely removes from Place to Place in and thro' the Substance of a Non-Electric, but not so thro' the Substance of Glass. If you offer a Quantity to one End of a long rod of Metal, it receives it, and when it enters, every Particle that was before in the Rod pushes it's Neighbour and so on quite to the farther End where the Overplus is discharg'd; and this instantaneously, when the Rod is Part of the Circle in the Experiment of the Shock. But Glass from the Smalness of it's Pores, or stronger Attraction of what it contains, refuses to admit so free a Motion. A Glass Rod will not conduct a Shock, nor will the thinnest Glass suffer any Particle entring one of it's Surfaces to pass thro' to the other. 37. Hence we see the Impossibility of Success in the Experiments proposed to draw out the effluvial Virtues of a Non-electric as Cinnamon for Instance, and mixing them with the Electrical Fluid, to convey them with that into the Body, by including it in the Globe, and then Applying Friction &c. For tho' the Effluvia of Cinnamon and the Electrical Fluid, should mix within the Globe they would never come out together thro' the Pores of the Glass, and so go to the Prime Conductor. For the Electrical Fluid itself can not come thro', and the Prime Conductor is always supply'd from the Cushion, and that from the Floor. And besides, when the Globe is filled with Cinnamon, or other Non-electric, no electrical Fluid can be obtained from it's outer Surface, for the Reason before mentioned. I have try'd another Way, which I thought more likely to obtain a Mixture of the Electrical and other Effluvia together, if such a Mixture had been possible. I placed a Glass Plate under my Cushion to cut off the Communication between the Cushion and Floor, then brought a small Chain from the Cushion into a Glass of Oyl of Turpentine, and carried another Chain from the Oyl of Turpentine to the Floor; taking Care that the Chain from the Cushion to the Glass touched no Part of the Frame of the Machine. Another Chain was fixt to the Prime Conductor and held in the Hand of a Person to be electrised. The Ends of the two Chains in the Glass were near an Inch Distant from each other, the Oil of Turpentine between. Now the Globe being turn'd, could draw no Fire from the Floor thro' the Machine; the Communication that Way being cut off by the Glass Plate under the Cushion: It must then draw it thro' the Chains, whose Ends were dipt in the Oil of Turpentine. And as the Oil of Turpentine being an Electric per Se could not conduct; what came up from the Floor was obliged to jump from the End of one Chain to the End of the other, thro' the Substance of that Oyl, which we could see in large Sparks; and so it had a fair Opportunity of Seizing some of the finest Particles of the Oyl in it's Passage, and carrying them off with it: But no such Effect followed: nor could I perceive the least Difference in the Smell of the Electrical Effluvia thus collected, from what it has when collected otherwise; nor does it otherwise affect the Body of a Person electrised. I likewise put into a Phial, instead of Water, a strong Purgative Liquid, and then charg'd the Phial, and took repeated Shocks from it: In which Case, every Particle of the Electrical Fluid, must, before it went thro' my Body, have first gone thro' the Liquid, when the Phial was charging, and return'd thro' it when discharging; yet no other Effect follow'd than if [it] had been charg'd with Water. I have also smelt the Electrical Fire, when drawn thro' Gold, Silver, Cooper, Lead, Iron, Tin, Wood and the human Body, and could perceive no Difference; the Odour is always the same, where the Spark does not burn what it strikes: Therefore I imagine it does not take that Smell from any Quality of the Bodies it passes thro'. And indeed as that Smell so readily leaves the Electrical Matter, and adheres to the Knuckle receiving the Sparks, and to other Things; I suspect that it never was connected with it, but rises instantaneously from Something in the Air acted upon by it. For if it was fine enough to come with the Electrical Fluid thro' the Body of one Person, why should it stop on the Skin of another? But I shall never have done, if I tell You all my Conjectures, Thoughts and Imaginations on the Nature and Operations of this Electrical Fluid, and relate the Variety of little Experiments we have try’d. I have already made this Paper too long for which I must crave Pardon, not having Time to make it shorter. I shall only add, That as it has been observed here, that Spirits will fire by the Electrical Spark in the Summer Time, without heating, when Fahrenheits Thermometer is above 70°. So when the Weather is colder, if the Operator puts a small flat Bottle of Spirits in his Bosom, or a close Pocket, with the Spoon, some little Time before he uses them; the Heat of his Body will communicate Warmth more than sufficient for the Purpose.